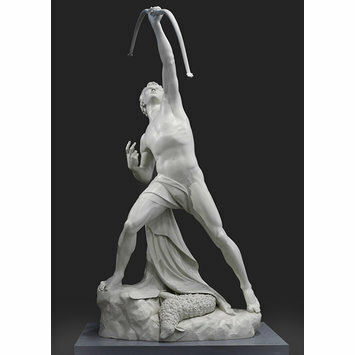 The Eagle Slayer was made in 1851 by the popular Victorian neo-classical sculptor, John Bell. The sculpture is made of cast iron, a material previously only used for industrial use. The sculpture shows a shepherd who, upon discovering one of his sheep has been killed by an eagle, fires an arrow and kills the eagle. The Eagle Slayer was originally displayed at The Great Exhibition in 1851. It stood outside the original V&A building when it was the South Kensington Museum. The Eagle Slayer was once again reunited with this building when it was brought to Bethnal Green in 1927. The sculpture is based on one of Aesop's fables: unwittingly we give to our adversaries the means of our own destruction. The eagle has just slain a lamb and the shepherd boy is exacting his revenge, he finds a feather dropped by the eagle. From the feather the boy fashions the most accurate arrow to shoot the bird on its return. The sculpture depicts the tale of a shepherd who had just released an arrow from his bow at an eagle which had just killed one of his lambs. The Eagle Slayer was originally displayed at The Great Exhibition in 1851. It was presented to the Exhibition's commissioner's at its conclusion, it resided for some years at Kensington Palace. It later stood outside the original V&A building when it was the South Kensington Museum. The Eagle Slayer was once again reunited with this building when it was brought to Bethnal Green in 1927. The statue was not formally acquired by the Museum until 1959, when it was 'rescued from a shrubbery behind BGM' (i.e. Bethnal Green Museum) after its position at the front of the Museum became occupied by a new flagstaff. In 1960, it was resited to a new position in the north-east corner, and placed on a Portland stone plinth made by the Ministry of Works (the designs for which can be seen on MA/62/1/21). However, by February 1961 it was observed that rust marks had begun to appear on the new stone base. By 1977, the statue had fallen into disrepair, having now stood outside the Museum for fifty years. The original bow had been long lost, and by this time replaced with a wooden one, which had subsequently been damaged and removed. In 2004 the sculpture was removed for urgent conservation work. Research revealed how The Eagle Slayer would have originally looked in 1851. Old paint layers were removed from the statue's surface and the rust damage was treated. Close analysis of the paint layers told us the original sculpture had been painted white to imitate Carrara marble. The statue had been painted black to reflect the late Victorian fashion. The Eagle Slayer was repainted to closely match the original white colour, and moved inside the building to better protect it. In 2017, the statue was placed on long-term loan to its place of making, now known as the Coalbrookdale Museum of Iron in Ironbridge, Shropshire. 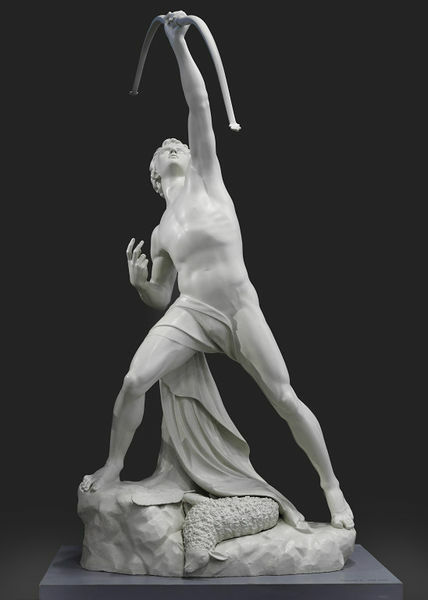 John Bell first exhibited a plaster version of The Eagle Slayer at the Royal Academy in 1837, this was shown again at Westminster Hall in 1844. A marble version was commissioned by Earl Fitzwilliam for Wentworth Woodhouse. A version cast in bronze was shown at the Great Exhibition, 1851, in addition to this one of iron.